To help bring to the United States chess of the highest quality in the world, Mrs. Gregor Piatigorsky and her husband, the world renowned cellist, created the Piatigorsky Cup as a symbol of excellence in chess. Along with the trophy went the finest playing conditions and the highest prizes ever offered for any chess event. For the first time since 1932, a world chess champion appeared in an American tournament when Tigran Petrosian, USSR, joined seven other of the greatest international grandmasters in a month of competition at the Ambassador Hotel in Los Angeles. Players, in addition to Petrosian, included Paul Keres, also of the Soviet Union; Miguel Najdorf and Oscar Panno of Argentina; Fridrik Olafsson of Iceland; Svetozar Gligoric of Yugoslavia; and Samuel Reshevsky and Pal Benko of the United States. 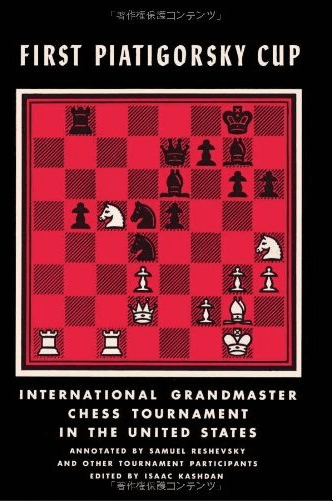 This book contains the complete score of all 56 games played by these eight international grandmasters. Each of the players annotated the game he considered his best and Reshevsky annotated the rest. The book is edited by Isaac Kashdan. Many of these games are likely to become classics and every chess player, from novice to master, will be able to learn fine points of the game from this volume. All games have been converted into modern Algebraic notation.